On Friday, March 31, from 7:30 a.m. to 5:30 p.m., the Boys and Girls Club of the Foothills (600 S. Shamrock) will hold an open house. 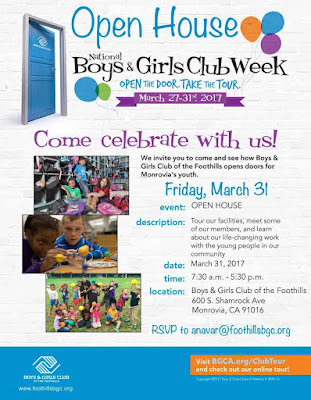 Tour the facilities and learn how the Boys and Girls Club is changing lives for young people in the community. For more information, email anavar@foothillsbgc.org.